It is said that the Sibylline oracle predicted the Fall of Rome, when the power of the Roman Empire was at its height: "O haughty Rome, the divine chastisement shall come upon thee; fire shall consume thee; thy wealth shall perish; foxes and wolves shall dwell among thy ruins: and then what land that thou hast enslaved shall be thy ally, and which of thy gods shall save thee? For there shall be confusion over the face of the whole earth, and the fall of cities shall come." This page lists our latest additions to our growing collection of texts, books and information about the Roman Empire, its history, and its civilization. We are continually expanding our collection and invite you to check back often for new texts and resources. Roman Farm Management - Apparently the Romans were conservationists in their way, and could teach us something about proper land management: "The foundation of their agriculture was the fallow and one finds them constantly using it as a simile--in the advice not to breed a mare every year, as in that not to exact too much tribute from a bee hive. Ovid even warns a lover to allow fallow seasons to intervene in his courtship." Romans and Teutons - A series of lectures about the Fall of the Roman Empire: "The Roman Empire, toward the latter part of the fourth century, was [utterly corrupt]. Private morality ..., had vanished long before. Public morality had, of course, vanished likewise. The only powers really recognized were force and cunning. The only aim was personal enjoyment. The only God was the Divus Caesar, the imperial demigod, whose illimitable brute force gave him illimitable powers of self-enjoyment, and made him thus the paragon and ideal of humanity, whom all envied, flattered, hated, and obeyed. The palace was a sink of corruption, where eunuchs, concubines, spies, informers, freedmen, adventurers, struggled in the basest plots, each for his share of the public plunder." The Romanization of Britain - This series of lectures describes how the Romans were able to turn conquered peoples into Roman citizens. 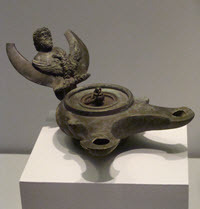 List of Roman Gods - A list of the chief Roman gods and goddesses and what they symbolized. Roman Legions - Information about the Roman Legions, including their weapons and tactics. See also this interesting ode to the Roman legions. History of Roman Empire - A short history of the Roman Empire written for young people. Many illustrations. 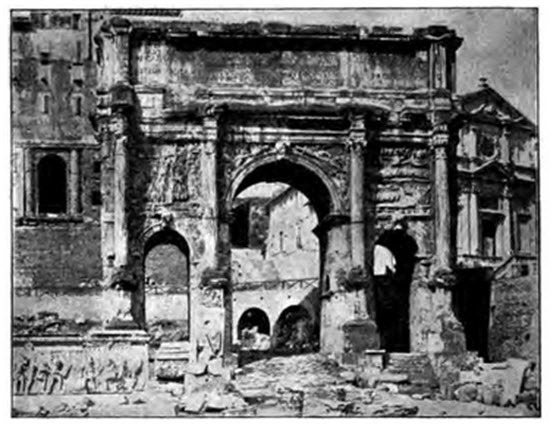 Graphics and Images of the Roman Empire - A collection of illustrations and graphics of famous buildings in Rome. Roman Myths and Legends - an explanation of Roman myths and legends and how they shaped the Roman world view, as well as a description of Roman religious beliefs and practices. Roman Religious Experience - a description of daily religious life among the Romans from the earliest times to the days of Augustus. It traces the evolution of Roman religious feeling from the homegrown cults to the prevalence of Asiatic and Egyptian cults which arrived in Rome as the Empire grew and came into contact with different modes of life. The Savegery of Roman Times - a short but insightful essay examining the difference in the morality of pre-Christian Rome and our own sense of right or wrong. Few Roman politicians died in their beds, and cruelty was a virtue. Theodoric the Goth: Champion of Civilization - This book makes the case that the barbarian king Theodoric actually helped preserve western civilization. Certainly he was less of a murderous savage than Attila the Hun. Roman Medicine - an outline of Roman medical science during the Empire as well as public health practices that contributed to the success of Roman civilization such as the public roman baths and sanitation practices such as aqueducts. Roman Women - a thorough overview of the role and status of Roman women within the family and society. Pagan and Christian Rome -a survey of the transformation of Rome from a pagan capital to the center of the Christian world.